How To Make A Perfect Bridal Bouquet For Your Wedding? Your wedding day is one of the most important days of your life. It’s such a day when you’ll get united with the love of your life. You would be the centre of attraction. Well, you want everything to be the best on that day right starting from the veil, jewellery, wedding dress to the cake, location, menu…..and the list goes on. But, among all these one of the most important thing which you want to be eye-catching and alluring is your wedding bouquet. Isn’t it? It’s because you as a bride can’t walk down the aisle without that. When it comes to this extremely beautiful custom of holding a wedding bouquet by a bride, very little is known about the significance of the same. But, one this known that it’s a way of incorporating flowers into wedding ceremonies as the beautiful blooms are the symbol of fertility. It is also believed that mind blowing sweet smell of the flowers would keep the evil spirits away from the bride. So, if you feel like that you yourself want to choose the colours and flowers as per your taste and also make this bouquet then it’s very obvious. You’ve all the rights to do so as it’s an integral part of the day which is going to change your life forever for better. In that context, today I am going to list out the steps in details which you can follow to make the most special bouquet of your life. Although white or cream colours are traditional when it comes to a bridal bouquet but it’s best to choose the colour according to the colour of your dress. I mean the flowers should complement the colour of your gown. But, you should keep in mind that your elaborate gown is going to be the centrepiece, so restrain with single or a small range of colours. The flowers need to be with strong and long stems that should support the bouquet without breaking. 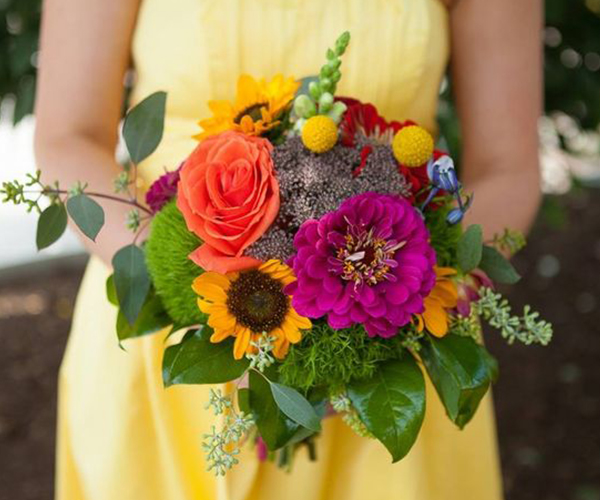 If possible, choose the flowers that will be in-season during your wedding. It’s because out of season flowers would be expensive and might require very advanced ordering. Moreover, it’s a very true fact that you might not get the exact flowers what you want from your home garden. So, in that case, buy some gorgeous blooms from any of the best online or in-store florists. You can obviously try the bridal flowers from moyses. It’s because moyses is one of the leading flower stores of the UK. It has the extremely gorgeous collection of flowers. The bouquet size is also another very important factor. Go for a small bouquet if it is an intimate place where you’ve just some of your friends and family. But, if your marriage venue is any large church or a beach then you must make a big one. It’s a good role of thumb that the wedding bouquet shouldn’t be wider than the bride’s waist. So, take care of the fact otherwise holding your wedding blooms together would be nothing but a tiring job for you. Then you need to trim the extra stems by holding the flowers at an angle of 45 degrees over a sink full of water. And keep them dipped in water until you’re ready to make the bouquet. Now, pull of the thorns and foliages and discard the discoloured flowers. Now, hold the largest flowers to create the centre. Now, keep on adding other flowers to expand the dome. If you’re using multiple coloured flowers then keep on adding one by one. Also, trim the long branches more if needed to handle it more easily. Once that’s done add some more small flowers to expand it more and more. You’ve to play with the bundle at this stage in your hand adjusting the heights and make sure that the bouquet looks round and balanced. If you’ve any bouquet jewellery then push these down in between flowers to throughout the bouquet. Now, bind the bouquet with a tape just beneath the flowers. This will keep your flowers tight together. Wrap the tape many times around the stems and spiral it down another 3-4 inches. You should choose a colour of the ribbon which matches your gown or bouquet colour. You’ve to cut a piece three times the length of the stems. You can weave the ribbon down the whole length of the stem tucking it into the floral tape at the top and the bottom. After it’s done keep the bouquet in water until the wedding time comes. You can even buy a flower preservative that would prolong flower’s life. So, just follow this step by step guide and you’re done! Thus, you can enjoy seeing your wedding bouquet with some vibrant blossoms with a customized special touch from yourself.